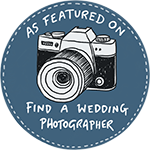 We are Sheffield wedding photographers and always keen on visiting new wedding venues. Hazel Gap Barn is a new wedding venue on the outskirts of Sheffield near Nottinghamshire. Its a beautiful converted barn with amazing high ceilings and large windows looking out onto the grounds. Joelle and Scott were getting ready nearby in separate holiday cottages. Joelle looked amazing in her gown – luckily although we were running late I could help her get dressed before she headed off for the ceremony! Scott was waiting nervously at the top of the ceremony room – the ceremony itself was lovely with personal readings. Outside the sun was shining for the reception in the grounds where we found lots of lovely areas for photographs. The reception room looked amazing and I was drooling over the cake table – they all looked delicious! After some funny speeches it was time for the evening celebrations to start with a band and lots of dancing! Helen & Paul are Sheffield wedding photographers. We photograph weddings in our home county of Cumbria and all over the Lake District as well as Yorkshire and the Peak District too!